Tracee Ellis Ross attends the Marc Jacobs Fall 2019 Show at Park Avenue Armory on February 13, 2019 in New York City. Tracee Ellis Ross kept the monochromatic theme going with a pair of gray Louboutins. 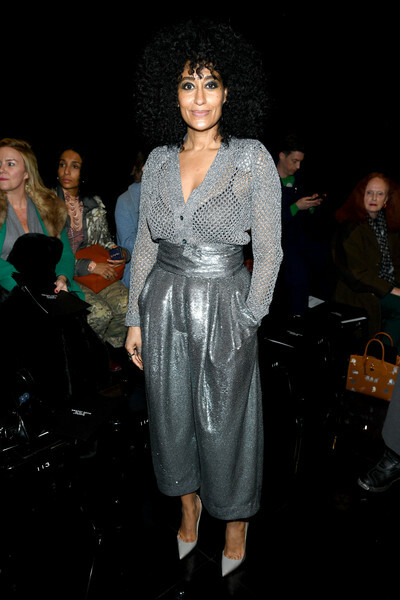 Tracee Ellis Ross donned a silver open-weave cardigan by Marc Jacobs for the brand's Fall 2019 show. Tracee Ellis Ross finished off her sassy look with a pair of silver wide-leg pants, also by Marc Jacobs.